Schmooze Com Inc announces completion of FreePBX interoperability testing of Uniden EXP1240 SIP DECT Cordless Phone System. We have completed interoperability testing of Uniden’s new EXP1240 SIP DECT line of cordless telephones. The Uniden SIP/DECT phones are targeted towards the SMB, enterprise and retail markets and currently support up to 200 cordless users per network segment. Uniden has worked directly with the FreePBX development staff to ensure FreePBX users, system integrators and resellers wanting to utilize the Uniden phones can easily configure them directly within the FreePBX End Point Manager. The FreePBX End Point Manager is a commercially supported add on to FreePBX that allows you to Auto Provision and Configure directly from the GUI administrator interface over 250 popular Desk Phones, Wireless Phones, Door Phones, Overhead paging devices, Gateways and Specialty devices. “We are excited that Uniden, connected with us as they moved into the SIP DECT mobility marketplace, and enthusiastically welcome them into the ever expanding FreePBX Ecosystem.” says Tony Lewis, CEO of Schmooze Com Inc. If you wish to see the Uniden phones in action stop by the Schmooze Com/FreePBX Booth (#535) at Asterisk World & ITEXPO in Miami. 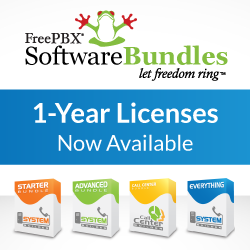 Previous PostWebRTC Softphone module now available for FreePBX!